The Nokia E62 is a bar design available through Cingular. The display is large, taking up the top half of the device, with the keyboard taking up the bottom half. 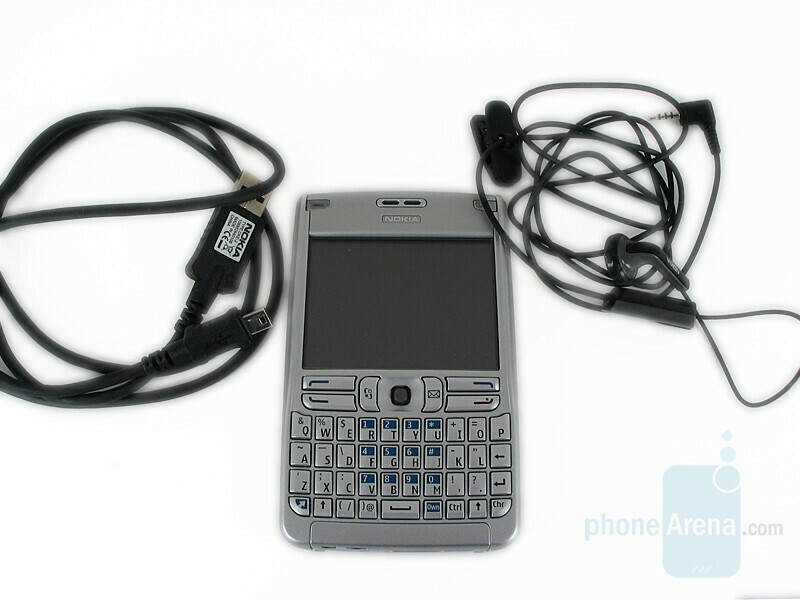 It has an all metal silver casing and is similar in size to the Blackberry 8700. Opening the box revealed an AC charger, USB cable, Users Guide and PC Suite software for your PC. There are several key features on this device that are just about required by anyone using a PDA integrated with a cell phone these days. Bluetooth, full internet, QWERTY keyboard, several email options, calendar and the ability to Sync with your computer all allow for ease of use. The Symbian operating system allows for a wide variety of third party programs to be downloaded onto the device, for a fee. You are able to view, and edit PowerPoint, Excel and Word documents, Adobe Reader, however we would recommend viewing and not editing Excel or Power Point files. Trying to edit them led us to frustration a few times before we finally gave up and went to a computer to edit them. The E62 lacks both the 3G band (UMTS/HSDPA), and Wi-Fi of its predecessor, the E61.